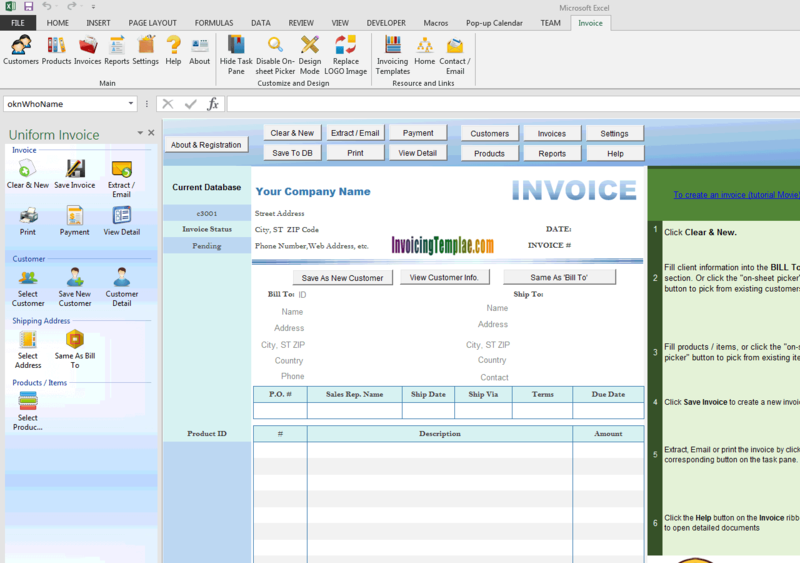 c3001 now includes the customized invoice template for the latest version of Invoice Manager for Excel. 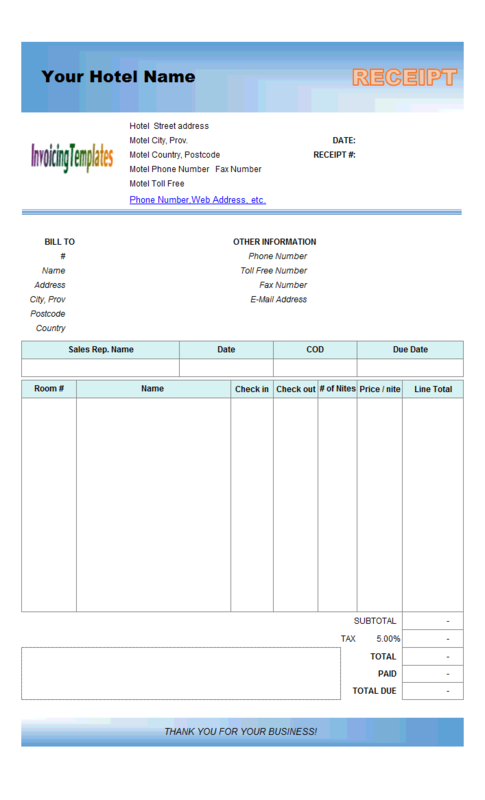 This is what you will see when you open basicsalesinvoicetemplate.xlsx. 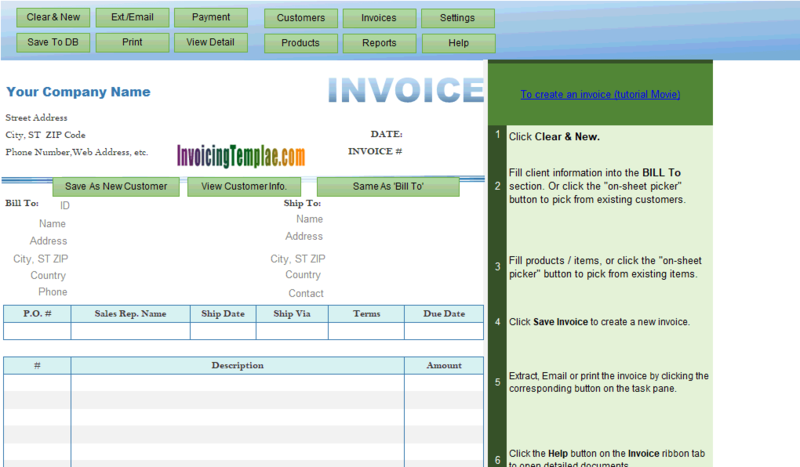 The ready-to-use Excel invoicing template can be downloaded from the "download" page. 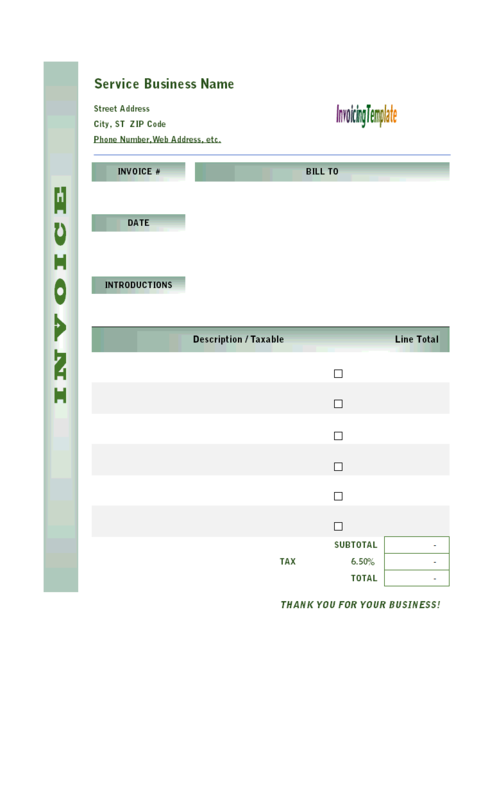 If you are interested in the details on how to create this template design from the default template, read on. To easily change the tax options, install Invoice Manager for Excel (namely Uniform Invoice Software), click the Settings button and then go to the Taxes tab, where you can choose taxing type (no tax, one tax and two taxes, tax names, tax rates, as well as other taxing options). 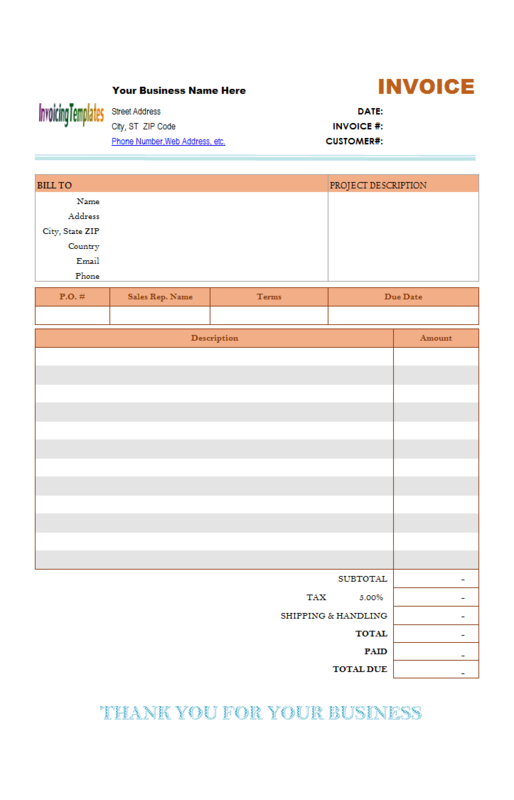 This basic sales invoicing template was designed with the small business owner in mind. 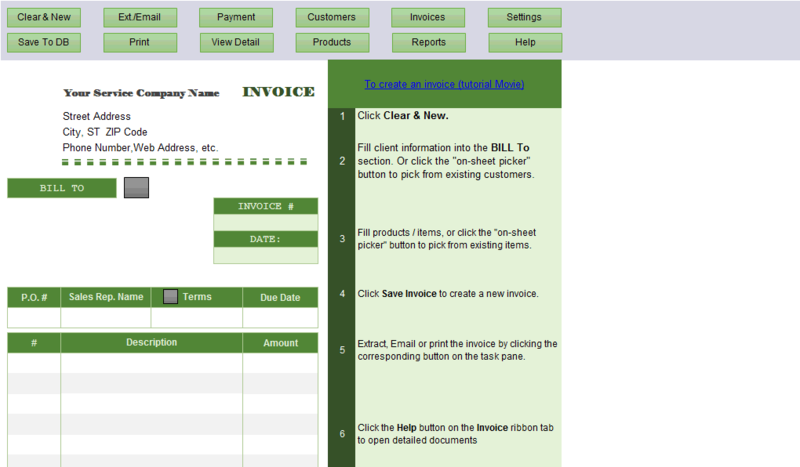 It is a simple, professional, free solution for invoicing your customers or clients. 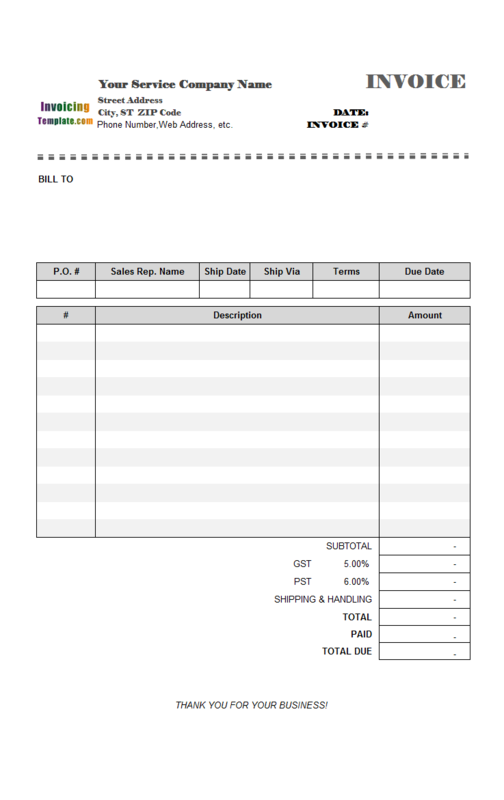 Unlike our service bill formats, the sales invoice includes shipping information. 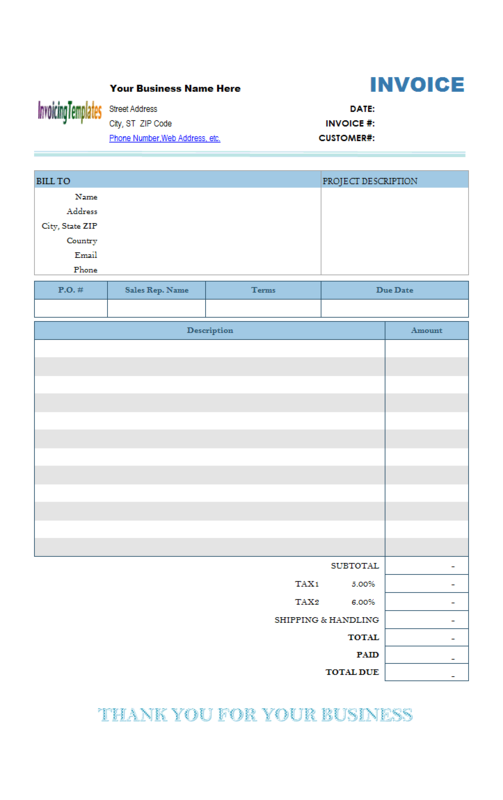 In order to create this basic sales invoice design (light blue) from the template, we moved the item#, unit price and quantity column out of the printable area, removed the formulas from the line total cells, and set the tax type to "no tax" with the help of Invoice Manager for Excel (namely Uniform Invoice Software). 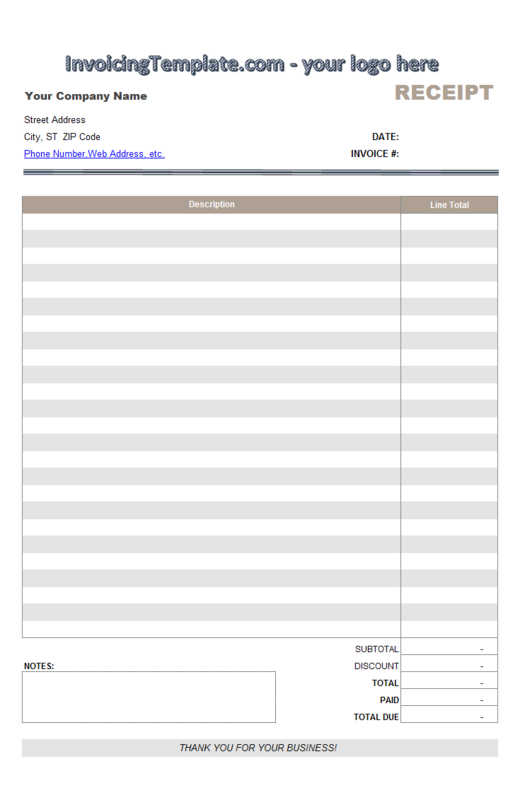 Before doing these types of customizations on the default sales invoice layout, you'll have to unprotect the spreadsheet and put the template into design mode. 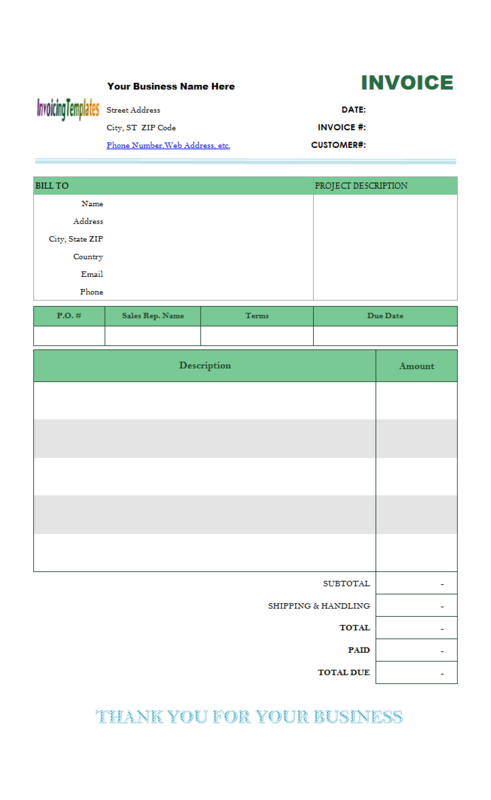 One the Excel spreadsheet is unprotected and put into design mode, you can move the Unit Price, Quantity and Item# columns out of the printable area. 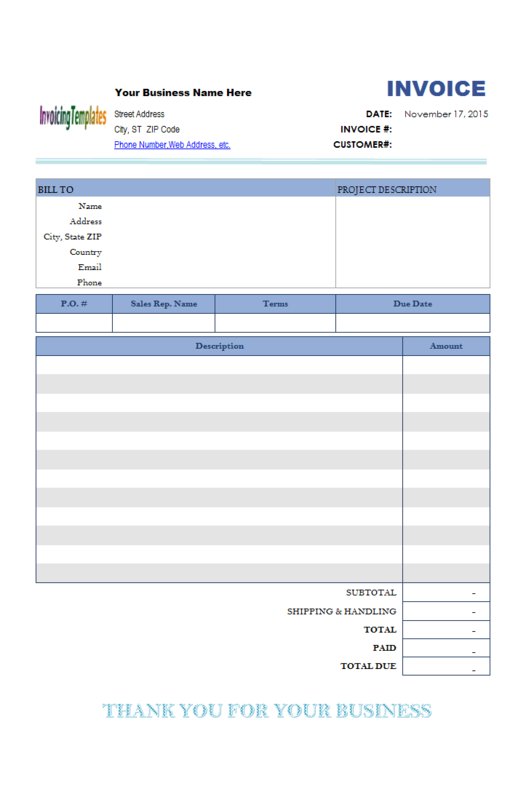 During the design of this invoicing spreadsheet, the "Merge and Center" command is also useful to set up the item description column. 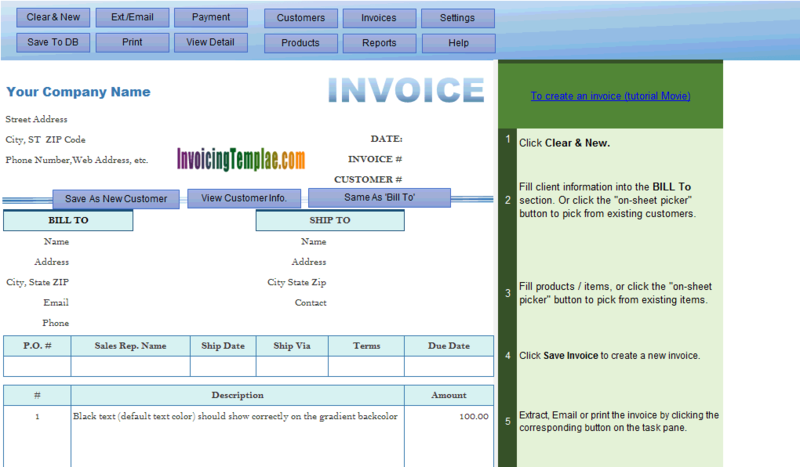 Unlick the default sales template shipping with Invoice Manager for Excel (namely Uniform Invoice Software), this template has no tax set. That's it! You've now seen the key steps involved in design this Template. 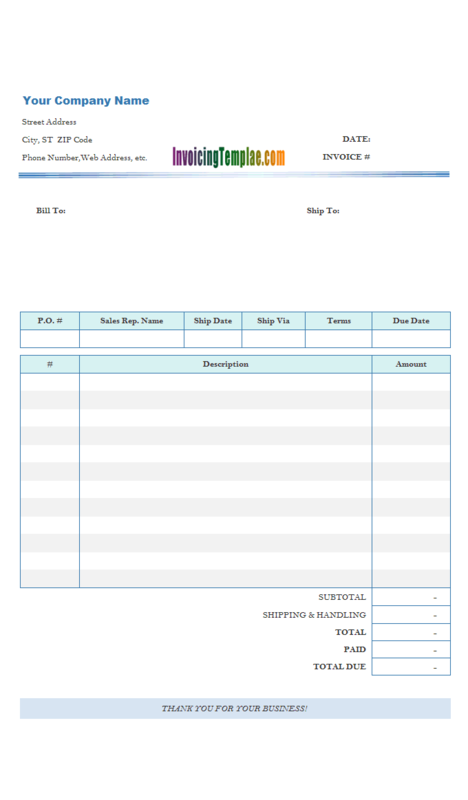 Download this template for free and see if it meets your billing requirements! 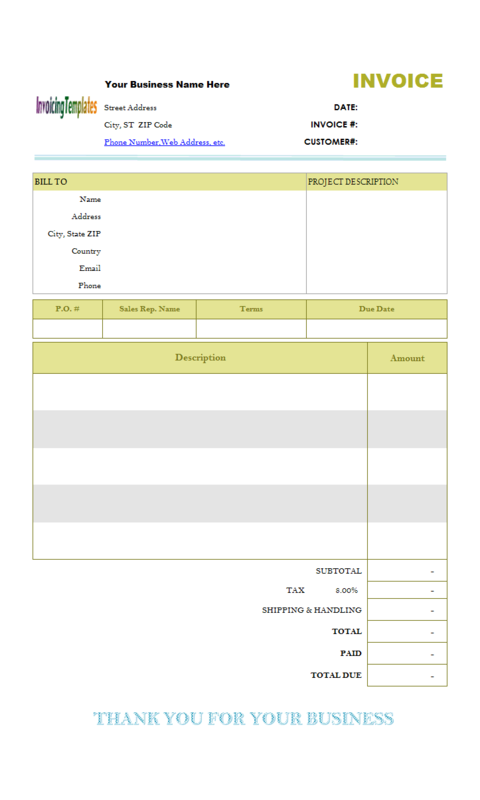 Like other form designs here on InvoicingTemplate.com, Basic Sales Invoice Design (Light Blue) is free (offered to you at a price of 0.00USD). It works on Windows XP and all newer versions of Windows, and Excel 2007, 2010, 2013 or 2016. 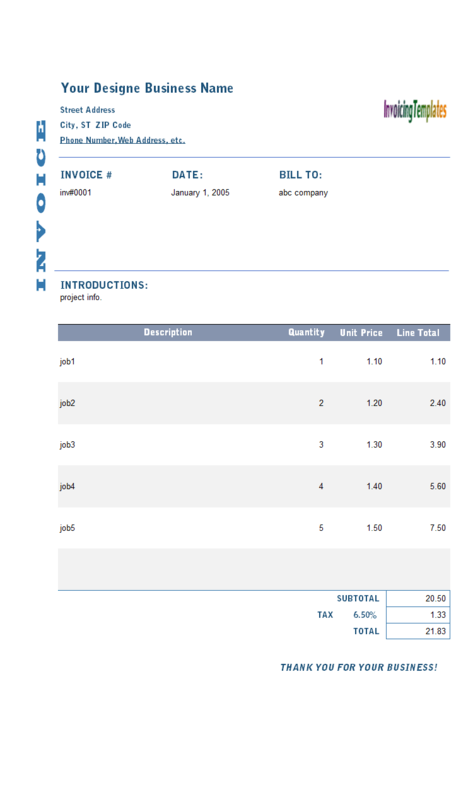 The title word of "INVOICE" was replaced with a word art object, with gradient blue filling effect. The default logo image placeholder was implemented using Excel form control, and moved to top center.